March is viewed as a critical month with the plate changes driving buyers into showrooms, leading to a healthier wider economy. With this being said, uncertainty has lead to an overall decrease of demand in both the private and business sectors, with registrations down -2.8% and -44.8%. Despite this, fleet demand remained stable, up 0.3%. Declines have been seen across almost every segment apart from EV. Alternatively Fuelled Vehicles have increased by 7.6% with 25,302 registered in March – the highest volume on record for a March. Another development in the indiustry is innovation, which is said to be driving forward comfort and safety. This is backed up with eight in ten new cars on the road now including new driver assistance technology, helping to alleviate driver error, thus preventing accidents. Excitingly, UK consumers could be one of the first to benefit from self-driving vehicles. If implemented widespread, this could help to prevent 47,000 serious accidents and save 3,900 lives over the next decade alone. Additionally, this breakthrough provides an economic opportunity of £62 billion by 2030. With the overall uncertainty of a ‘no deal’, this is thought to potentially have a destructive impact on UK’s position regarding the global market and innovation. 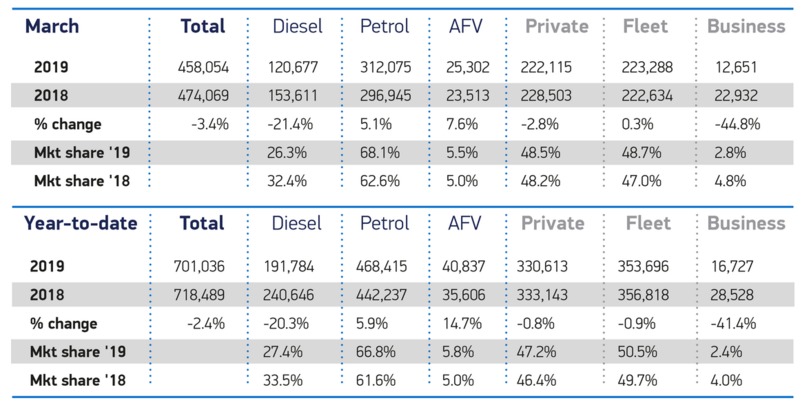 Despite this, Alternative Fuelled Vehicles have increased their market share by 0.5% in comparison to this time last year. When we reflect on this year to date, market share for Alternative Fuelled Vehicles has increased by 14.7%, with an overall market share increasing 0.8% more than 2018. Are you ready to go electric? If you wish to invest in your own green future, please get in touch with us at EV Camel!